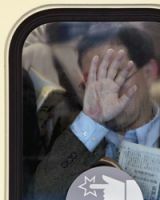 Rush hour in Tokyo: from the platform of the subway the German-American photographer Michael Wolf shoots through the subway car windows at the riders who are squeezed inside. The photographs that emerge show the stifling situation that thousands of people here have to go through every day. The view through windows, often clouded or fogged by dripping condensation, makes the extreme lack of space almost physically perceptible. 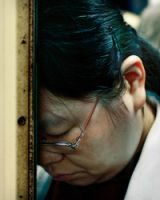 In the photo series Tokyo Compression Michael Wolf explores the strategies people use to endure the extreme confinement in the subway. Although the rules of society forbid an immediate reaction, a betrayal of emotions brought about by their physical distress — anxiety, fear, aggression, or disgust — shows the suffering in the faces of those portrayed. The hands held in front of the face or body protect a private sphere, which does not exist in the here and now. Closed eyes bear witness to the escape to an inner exile. Resignation shows when the portrait subjects look directly into the camera of the photographer, without visibly reacting to it. Mass transport makes the individual lonely and turns the subject into an object. As such the passengers are all alike because they find themselves in the same inescapable situation; social or national differences play no role, each personal biography is meaningless here. The individual is a part of a homogenous, anonymous mass, in which no real "we" of a meaningful community exists. The lack of space interrupts this "we" — and upon exiting to the outside, the time constraints of modern society will overtake it. Despite the subject matter Michael Wolf's portraits are not disturbing in and of themselves; at the most they can trigger a little discomfort in empathetic viewers. 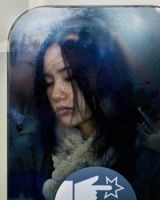 Yet the viewer can find beauty in the photographs: the color, the expressions on the faces, the water drips on the subway car window which sometimes only allow us to see the people as hazy apparitions. Tokyo Compression is a part of the photographer's examination of the conditions and phenomena of urban life. In Wolf's other work the high-rising architecture of Hong Kong or Chicago swallows up people, making them anonymous, in Tokyo Compression he traces the helplessness and loneliness of modern people within our highly engineered living environment. Michael Wolf was born in Munich in 1954 and grew up in the United States. From 1972 on, he made his studies at the University of California as well as in photojournalism at the Folkwangschule in Essen with Otto Steinert. In addition to journalistic commissions for international newspapers like STERN, he worked for the Laif agency and realized his own projects for many years. The renowned photographer and photo book author lived for many years in Hong Kong and is well acquainted with the Chinese mentality. Wolf won the World Press Photo Awards first prize in 2005 and 2010 and is nominated for the Prix Pictet 2010 (Theme "Growth") for the series Architecture of Density, which shows the skyscrapers of Hong Kong. In his most recent project Paris Street View he seeks traces of the private on Google's world maps.